Omaar: What gives you the confidence and the feeling that this is indeed a golden period of China-UK relations? 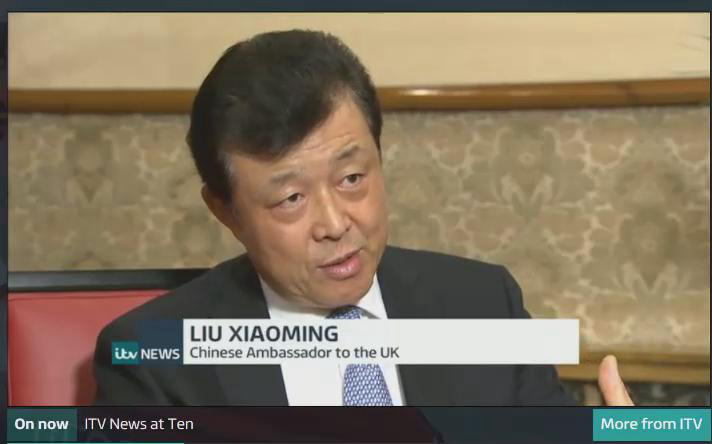 Liu: My confidence comes from my contact with the British people from all walks of life, from top to down, from the Prime Minister's visit to China, the Chancellor's visit to China. They both said Britain wants to be the best partner for China in the West. Britain wants to be the strongest supporter for China in the West. In fact, the expression "Golden Era", the word "golden" , was first used by Prime Minister David Cameron. At the beginning of this year, I expected a series of important events in China-UK relations. In my very first public speech in the Parliament for celebrating the Chinese New Year, I used the word, I said that 2015 will be a "big year" in China-UK relations. We were expecting the visit by President, the visit by Prince William to China which was the very important royal visit to China in 30 years since Her Majesty's visit to China in 1986. Then when we celebrated the Chinese New Year, Prime Minister Cameron in his new year message he used the word "golden year". He sees this year as a golden year. When I met with him in No. 10 for the Chinese New Year Reception, I told him, Prime Minister, I think your "golden year" is better than my "big year" so we reached the consensus that this year is a "Golden Year". After the election, in his telephone conversation with Premier Li Keqiang, Prime Minister Cameron proposed that we should work together for the "Golden Time" for China-UK relations. And that idea was endorsed by Premier Li Keqiang. So now we're not only talking about "Golden Year", we are talking about "Golden Time" and "Golden Era" for China-UK relations. Omaar: But it was only a short time ago that you were publicly saying that Britain was lagging behind other European countries in their relations with China. Has it really changed so much? 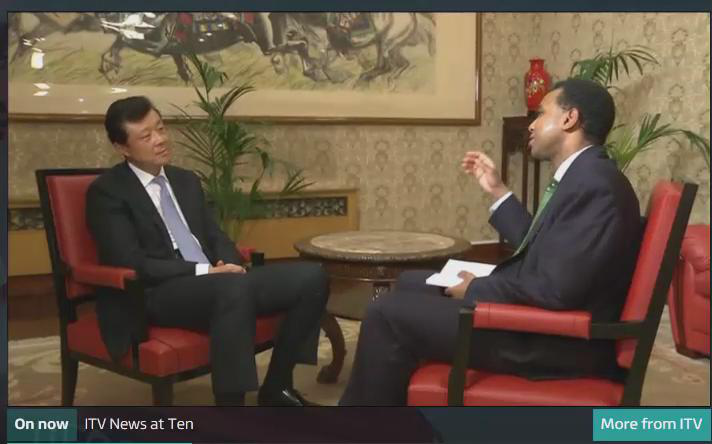 Liu: In fact, when I said the UK lagged behind the other European countries, I was talking about the political relations. I think my comment was not fully reported. The question put to me was about how I see China's relations with the UK, and China's relations with France and Germany. I said, each bilateral relationship has its strengths. I listed five to ten areas where China-UK relations are strong. But I said, we are still week when it comes to political trust and political relations. But political relations are really the foundation of the overall relationship. The media however were interested in the negative side rather than positive side of the comment. Omaar: But the positive side comes in this - even though you felt that a short time ago Britain was lagging behind in its political relations with China - that seems to have changed dramatically. Liu: One year. More than one year. You know within this year there were a series of high-level contacts. The Prime Minister went to China. The Chancellor went to China twice. Immediately after the British election, Chinese Foreign Minister was here to set up early contact with the new government. Then in June, two senior Chinese leaders came here. Between China and the UK there are three pillars or mechanisms, what we call, to support this relationship: Strategic Dialogue co-chaired by State Councilor of China and the UK Foreign Secretary, Economic and Financial Dialogue co-chaired by Chinese Vice Premier and the British Chancellor and High-level People-to-People Dialogue co-chaired by Chinese Vice Premier and the UK Secretary of State for Health. All these three mechanisms had a meeting in September. Very intense exchanges of visits. All these lead up to this state visit of President Xi. So political relations between China and the UK are very strong and political mutual trust has very much been strengthened. Omaar: The issue of human rights, China's human rights will be raised. I understand that the leader of the Labour Party Jeremy Corbyn has said that he is going to raise it. How does China react to criticism of its human rights record? Liu: I think we are open to discussions about human rights as I said in the press conference. We don't shy away from discussing human rights. As I said, the important thing is to have the big picture. When talking about human rights, you have to approach this issue from a comprehensive perspective. Some westerners, politicians and media people, they only focus on some individual cases, but missed the big picture of the progress of China's human rights. In the past 30 years, there are enormous changes in China. I think any people who holds no bias would agree about the great advancement on China's human rights. What is human rights? When you talk about human rights, you talk about people's right for better living, better education, better job, freedom of speech, freedom of assembly and freedom of travelling around. When some people talk about human rights, they try to dig out some individual cases which they think are focus on or concerns about human rights. What would you say about China elevating 600 million people out of poverty just within 30 years of time? It's a miracle. No country has done that. The medical care in China covers almost 100% of the people. Each year now, the number of Chinese people travelling outside China is about 100 million. The Chinese people are living longer and happier. They are enjoying their lives. I think that's basic right of a human. Omaar: But there will always be these cases of dissidents that are raised. Is it possible for China to have good relations with a country economically and otherwise, whilst at the same time these individual cases are raised? Can you have that relationship? Liu: We can only agree to disagree. I think there are certain international norms countries should follow. The basic norm is non-interference in each other's internal affairs. If I see your system as not perfect, if I see you have cases I'm not happy about, then I hold the whole relationship hostage. Will that be in the interest of the UK or China? We have a channel to discuss our differences over human rights. As I said, no country is perfect. You have your concerns and we also have our concerns. I can give you a list of concerns of cases where we don't think human rights are perfect in the UK and US. But I think the whole purpose of a high-level visit and the main mission of the Embassy and Ambassador here is not to represent an NGO of human rights. Human rights is one of the areas in relations between China and the UK. We have broad interests for collaboration. I think people in the UK care more about their jobs, about a better live, about their education. That's the same for the people in China. The government leaders have to find common ground how we can work together for common good. We can debate but we should not miss the big picture. If we spend all our time debating, I don't think you will have a winner from this. Omaar: Can I talk about the growing economic relationship, which is an important part of this golden era of UK-China relations. The agreement for China to be involved in the Hinkley nuclear power project was a significant moment. Is that a field where Chinese companies would want to be involved more in the UK? Liu: I think Chinese companies are interested in all projects where they think they can get good returns and help promote their businesses. In China, yours are the same. Omaar: So they are looking at all different areas, nuclear power, housing. Liu: Yes, of course. Infrastructure, Hotels. Albert Dock where Chinese companies invested about 1 billion. Sunseeker-they bought it. Even Wentworth is owned by Chinese businesses, the golf course, the top brand club. Omaar: And Heathrow Airport, 10%. Omaar: And there'll be a big business delegation coming with the President? Liu: They will be here separately. They are not part of the entourage. When you have a state visit, which is quite different from other visits, it is really a big event that all sectors from both sides focus on, they want to use this visit to promote collaboration across the board. They want the President and the Prime Minister to witness the signing ceremony. It's a kind of pride and honour for their businesses. Omaar: When you talk about it, describing it as a super state visit, it's almost like a restart of the relations between China and the UK. Would it be too much to say that? Not a restart, but sort of re-energisation. Liu: Yes, that's exactly the word I used, to re-position, how we move from here to a higher-level. That's why I call it a "new milestone". It's a landmark linking the past and the future. So this is an important visit. We haven't talked about "Golden Time" or "Golden Era" in previous years. This is really the first time both sides have this consensus that we work towards the "Golden Era" for China-UK relations. Omaar: Is it being reported widely in China, the state visit? How is it being seen there? Liu: The Chinese people have high expectations for this visit. Chinese people like the British people, just like the British people like Chinese people. I read a poll several months ago, that in the West, in Europe, the percentage of liking for China among Britain people is higher than many other European countries. I think the same can be said in China. When the British government decided to take the lead to join the AIIB, I was just in China. It was well received and widely welcomed. They see that the British leadership has the vision. They see that Britain sees the rise of China as an opportunity, not a threat. The two countries see each other as partners earnestly. They really see opportunities for cooperation, not just for pomp, word or slogan. We really mean business. Omaar: One of the issues that has been high on the agenda in the UK recently is that Britain used to be a very big steel-producing country. The Redcar steel mill has closed down because of the availability of cheap steel from China. Should communities in steel-making areas be worried about China? Liu: When we are in the age of globalisation, every country has to make adjustment. In some areas where China is strong, others need to make adjustment, vice versa. You know, China used to be very strong in processing of clothes, shoes and toys. I think China provides 80-90% of the toys in the world. No more the case now. Some Southeast Asian countries are now very strong in these areas. Low cost of labour has made them more competitive. So you have to make adjustment. If you continue staying with your old and traditional business, you are losing money and opportunities. That's why China makes its own adjustment. That's why some people are concerned about the slowdown of the Chinese economy. In fact, it's a healthy slowdown. Even with the slowdown from double-digit to 8% or 7%, China is still the leader in terms of growth. China is making adjustment. Why not Britain? Omaar: Prince William is making a television speech shown in China, talking about the illegal trade in wildlife. Is China cooperating with that? Liu: Very much. China is strongly supportive of the international efforts to fight against illegal trade in endangered species and to protect wildlife. In fact, China has taken its own initiative in this area. When Prince William was in China, I traveled with him. I also sat in a meeting he had with the President. They talked about how China and the UK can cooperate in protecting wildlife and fighting against illegal trade. President Xi told him about the efforts China has made, including destroying five tons of tusks, which shows determination of the Chinese government. China has been an active participant in many international conferences. When Prince William and the Prince of Wales sponsored an international summit here for the protection of wildlife, China sent a large delegation to attend this conference. China is also hosting its own forums for the protection of wildlife. I believe there is a great potential of cooperation between China and the UK in this area.